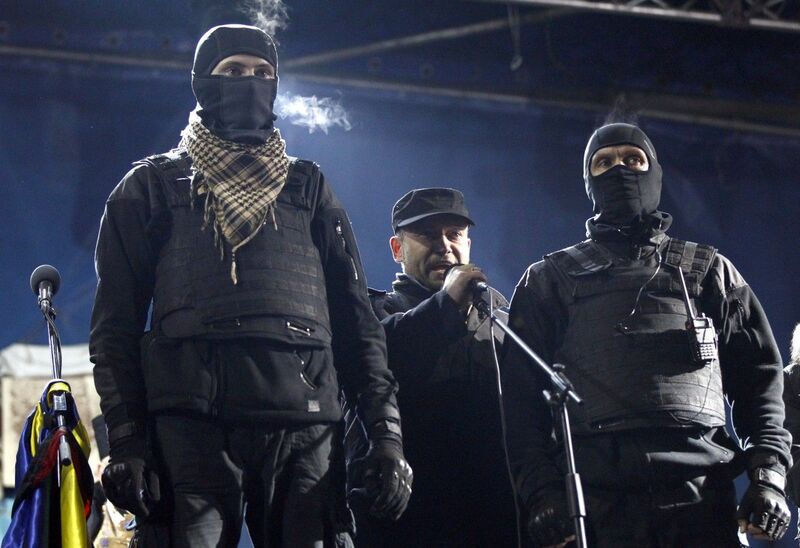 Q: Is it true that you have been training Right Sector forces for over 20 years? A: I was training paramilitary troops for almost 25 years. Although we just came out of the revolution, my guys are continuing military training all across Ukraine, ready to cleanse the country of the occupiers. Q: How many are you? A: I cannot give you the exact number, as our structure and divisions are constantly growing all over Ukraine, but over 10,000 people for sure. We have certain preconditions for our recruits: patriotism and other criteria for proper behavior. Q: Are you aware that a Moscow court is trying you for calling for terrorist actions against Russia? A: That is Putin's idea. He is a political corpse. Q: Do you have many war veterans in your ranks? Are your forces a part of Ukraine's army? A: As soon as Russia declared the war we recruited retired officers, generals of the interior ministry and security agencies. We are coordinating our actions with the council of the National Security and Defense, as well as with the army's General Headquarters. We are currently negotiating to put our forces on a proper legal footing. Q: If the Crimea population decides to become a part of Russia at the referendum on Saturday, what will be Right Sector's reaction? A: Right Sector, together with all other Ukrainian citizens, are ready to defend Ukraine's territorial integrity by all possible means. In case the Kremlin decides to attack us, they will have a major partisan war on Ukraine territory. Q: Do you think Ukraine has enough forces to defend itself? A: I am realistic about the pitiful conditions of our military forces, including Right Sector. Our army is many hundreds of times weaker than Russia's army so it's important for Ukraine to do everything to resolve the crisis through negotiations. Q: Why do you call your organization paramilitary? are you armed just with Kalashnikov's or do you also have more serious weapons? A: As in any army, we have specialists trained to shoot S-300 missiles. In case of a partisan war, there will be shooting from every house. Q: Do you realize that the majority of Russians including cultural and intellectual leaders support Putin's actions in Crimea because they see you as a leader of a fascist, radical movement? Are you ready to become the reason for the end of years of Russian-Ukrainian friendship? A: Unfortunately, Russia is largely brainwashed. Ukrainian nationalists have nothing to do with fascism. The powerful Russian propaganda machine knows what it's doing. The beliefs of Right Sector are against chauvinism. We base our views on nationalist ideas. The proof is that 40 per cent of our members speak Russian; Jews and other nationals feel comfortable in our forces. Q: What then makes your movement "Right"? A: We believe Ukraine deserves to have its own national state. That is what makes our movement "Right." Q: Was your book "Nation and Revolution" -- where you defined your movement's enemies as the Russian Federation and the Russian Orthodox Church -- a prediction of "the liberating war" of the Ukrainian nation? A: The book is a collection of my articles that was criticized when it first came out. But now we see that it predicted many events that have now happened. I would advise Russian citizens to start their struggle against Putin's fascist regime. That would be the best guarantee of friendship between Russian and the Ukrainian people. So long as Putin is in power, Russian imperialism will always be putting improper pressure upon Ukraine. Q: Why do you refer to the Russian president, who enjoys high popularity ratings, as a "fascist"? A: Putin built up his power by fascistic methods. He ignored the constitutional rights of Russian citizens. In Russia, police beat up those taking part in mass protests in Moscow and St. Petersburg. That smells of fascist methods to me. They arrest protesters carrying anti-war signs. That is fascism. Q: It is broadly believed in Ukraine that the revolution would not have happened without Right Sector. What kind of revolution was it? A: We had a nationalist revolution to create a state where Ukrainian people would be the master of their own destiny in their own land. Until now, we have had an occupying regime. We'll do everything to give our people full freedom, justice and a share of the nation's wealth. Q: Your men are all over the center of Kiev. Why do you and your men wear black uniforms? A: This is not an official uniform. We bought uniforms sold to security guards. I have taken professional advice about strengthening our security. We have been given information that some Russian forces are interested in kidnapping, arresting or liquidating me. Q: Who is it that is shooting on the Maidan every night? A: That is not my people. My men never use their weapons unless there is a specific need. Q: You are running for president. What special attributes do you have that qualify you to be a politician? Do you think you have a chance to win the presidential election? A: I graduated from university, specializing in Ukrainian language and literature. I never intended to be a politician. But since January 19 this year, I have been responsible for all the events. We have seen two miracles happen already: politicians have not betrayed the revolutionary spirit of the Maidan; and we won the revolution. I expect one more miracle to take place at the presidential election. Q: Did your movement support Chechen insurgencies in Russia? A: We supported the first Chechen war against Russian empire. We sent a delegation to Chechnya. We helped treat the Chechen wounded here. And we publish Chechen books. Q: Did you really call for Islamic insurgencies to support Ukraine in the war against Russia? Did any of your men meet with the Chechen insurgency leader Doku Umarov? A: I didn't say that. I am not sure. When we were helping Chechnia, Doku Umarov was just an ordinary field commander. We are not supporters of the Islamist war against defenseless women and children. Q: Yesterday, Ukraine's former president Victor Yanukovych said the new leadership is going to raise Bandera flag that is considered fascist in Russia. Is that true? A: We stood under red and black flags throughout the revolution. Red Ukrainian blood spilled on the black Ukrainian earth - that flag is the symbol of the national revolution. I am convinced that this flag will bring us freedom. Q: Who finances you? Do you think the West is going to support Ukraine? A: As a matter of principle l do not take money from oligarchs as we do not want to be dependent. We received some US dollars from the Ukrainian Diaspora. Otherwise the entire country supports the Right Sector. I am sure that if Russians bombed Kiev -- and we believe there is 50/50 chance that will happen -- NATO will not come to fight for Ukraine. Europe has betrayed Ukraine many times. We are not counting on them. We can only count on our own forces and our ingenuity.